Tickets go on sale to the public on Saturday, March 23 at Avid Reader Active in Downtown Davis. Cost per ticket is $10 per person, and all children must be accompanied by an adult. The festivities include a continental breakfast for all, followed by quality time with the Bunny. 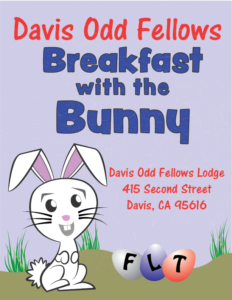 After breakfast, the Bunny with his sidekicks will lead children accompanied by parents to the large lawn by Davis Community Church to hunt Easter eggs hidden earlier. After the egg hunt, children and parents can either go home or return to the Odd Fellows Hall for storytelling, games, and cookie decorating till noon.